Samsung Electronics Co. Ltd is now introducing new range of Home Appliances, along with appointing “Orient Group of Companies.” as the new official distributor for Home-Appliances across Pakistan. A press conference and media lunch was recently held in this regards, at a Country Club in Lahore. The General Manager Samsung Pakistan, Mr. Steve Han said, “There is a huge potential for growth in Home electronics market of Pakistan, which has attracted many players from the international electronics industry Samsung has a firm resolve and robust plans for investing in developing countries. It considers Pakistan as a promising market, with a vast population and sustainable economic growth Thus, the demand and competition in Pakistan is increasing as the customers seek to reduce domestic work-pressure by using more innovative appliances. 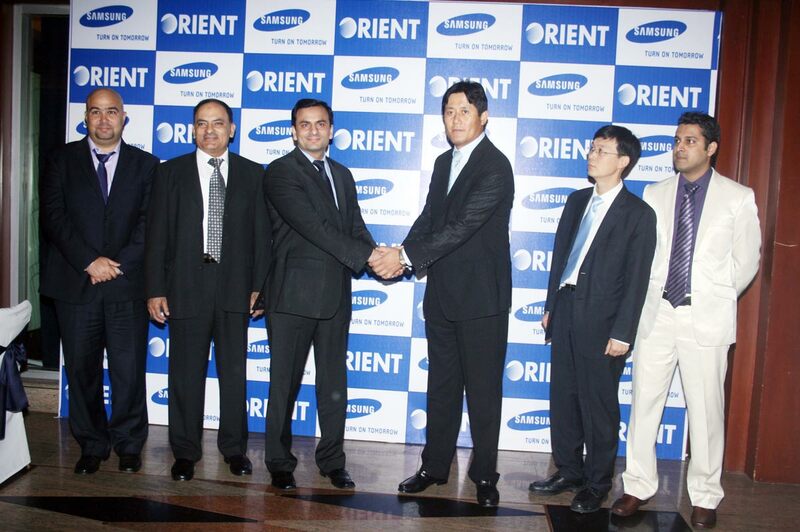 Mr. Ahmed Fazal, Director Marketing, ORIENT Group of Companies expressed his views and stated, “We are confident to partner with Samsung Electronics feel that these Home Appliances’ are brilliantly manufactured and will fulfill the needs of our consumers. We thank Mr. Steve for having trust in our company and together we will gain success”. A separate Samsung Dealer event will be arranged on the next day product introductions. Orient Group of Companies has a team of qualified and experienced professionals for promoting innovative electronic products, through a swift dealers network across Pakistan. This collaboration will enable Samsung to proactively enhance its services and streamline distribution all over the country. This introductory press-conference was chaired by the General Manager-Samsung Pakistan, Mr. Steve Han along with the Senior Manager-Samsung Electronics, Mr. Injae Lee, while the Home Appliances Category Head, Mr. Babaer Ali Kazmi also addressed the media. Baber Ali Kazmi, Home appliance category Head Samsung Electronics also stared, ‘Samsung Home Appliances are very economical and affordable for our consumer, at the same time maintaing a level of quality and style we believe that Orient Group of Companies will surpass our expectations when they will be handling Samsung products in the market”. He added further that ‘Samsung has launched a new range of Air-conditioner, Refrigerator, Vacumm Cleaner, Washing Machine and Microwave ovens. These new products have already proved to be among the best on a global scale and have been customized as per local needs Samsung side-by-side refrigerator comes with a powerful Twin-Cooling feature, while the “Virus-Doctor” technology in the New Air-Conditioner protects your home from Swine-Flu and other infectious viruses. Moreover, the new automatic washing machine, features and especially precise Voltage control. hopefully we would get Samsung’s energy efficient refrigerators and washing machines. I purchased two years ago an Orient fridge, but after 3 months of its purchase, it started to giving cracking pipes voices. I have been continuously contacting the service center, but so far no proper service has been provided to me. I am upset because of that. If Orient is conscious of consumers satisfaction, then i will wait for a proper reply. orient is the best brand now in pakistan ..
orient work hard to imprive services ..
and i m sure that the orient become a highest brand in few month…..
o say orient pehli chahat……..
becoze they work all they and also after their duty time…….